The Sculpture Park at Madhavendra Palace, Nahargarh Fort, Jaipur was formally launched by the Hon’ble Chief Minister of Rajasthan, Vasundhara Raje on Sunday 10 December 2017. 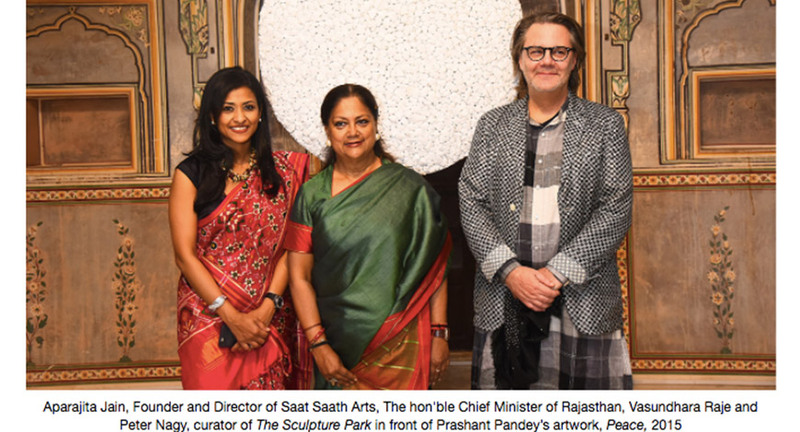 Through a unique collaboration between the Government of Rajasthan, Saat Saath Arts and a number of corporate sponsors, Madhavendra Palace has transformed into India's first contemporary Sculpture Park, exhibiting a range of top Indian and international contemporary artists. The launch of The Sculpture Park commenced with a walkthrough for the press by curator Peter Nagy. The Hon'ble chief minister of Rajasthan, Vasundhara Raje arrived in the evening and officially inaugurated the event with a speech which emphasized the importance of the initiative and thanked the team of Saat Saath Arts and the officials who supported this project. Her speech was followed by Malvika Singh, Full-time member, Chief Minister's Advisory Council (CMAC), Government of Rajasthan, Peter Nagy, curator and Aparajita Jain, founder and director of Saat Saath Arts. The Hon’ble, Vasundhara Raje was given a walk of through of The Sculpture Park by Peter Nagy where the artists were present. A Performance by The Kutle Khan Project took place at the palace later in the evening. Some of the other key individuals who attended the opening were Smt. Krishnendra Kaur (Deepa), Minister, Art & Culture, Archaeology & Museum, Tourism, Civil Aviation, Rajasthan, Nihal Chand Goel, additional chief secretary, Tourism, Art and Culture, Rajasthan, Punit Goenka, MD & CEO of Zee Entertainment Enterprises Ltd, Shreevar Kheruka, CEO, Borosil Glass Works Ltd, Sangita and Tarini Jindal, JSW Foundation, amongst many others. 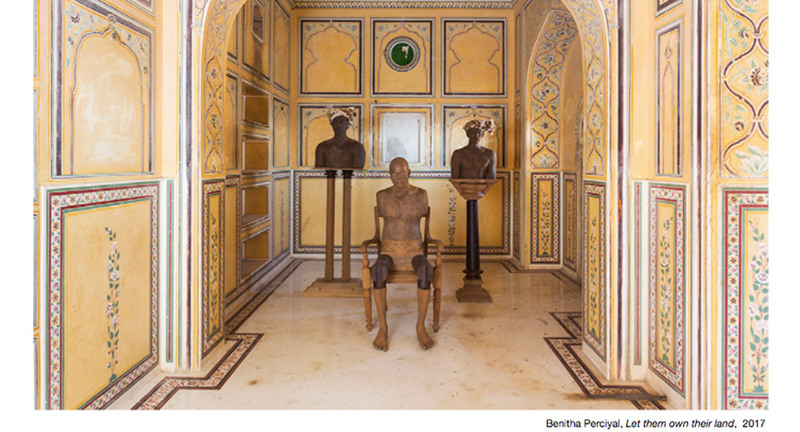 The Sculpture Park at Madhavendra Palace, Nahargarh Fort has turned the palace into an art gallery with sculptures by top Indian and international artists displayed both in and outdoors. The exhibition includes artworks by 15 Indian and 9 international artists and is curated by Peter Nagy, Director of Nature Morte Art Ltd. The works will be on display until November 2018. Artists include Arman, Huma Bhabha, James Brown, Stephen Cox, Anita Dube, Vibha Galhotra, Vikram Goyal, Subodh Gupta, Evan Holloway, Matthew Day Jackson, Hans Josephsohn, Jitish Kallat, Reena Saini Kallat, Bharti Kher, Mrinalini Mukherjee, Manish Nai, Gyan Panchal, Prashant Pandey, Benitha Perciyal, Ravinder Reddy, Arlene Shechet, L.N. Tallur, Thukral & Tagra, Asim Waqif. 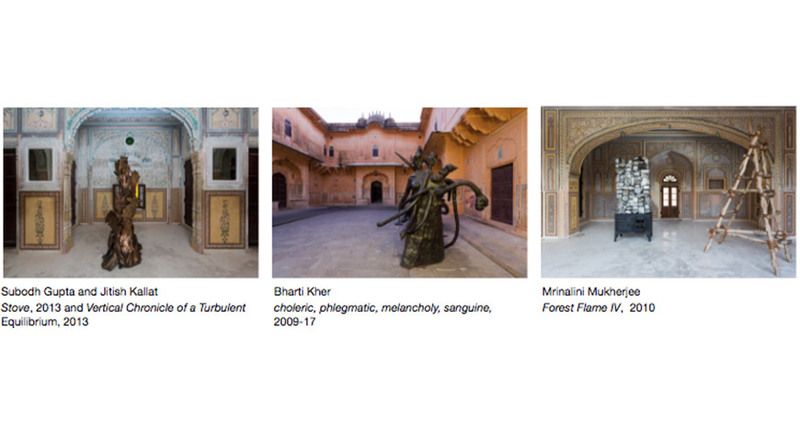 All artworks for the exhibitions are sensitively installed to ensure no damage or markings to any surface of the Palace. “For most of my career as a gallerist and curator, I have been trying to break away from the white-box exhibition space. With this project, I am able to indulge my passions for art, architecture and decor into a marvellous synthesis of the past and the present.” - Peter Nagy, Curator, The Sculpture Park at Madhavendra Palace, Nahargarh Fort. 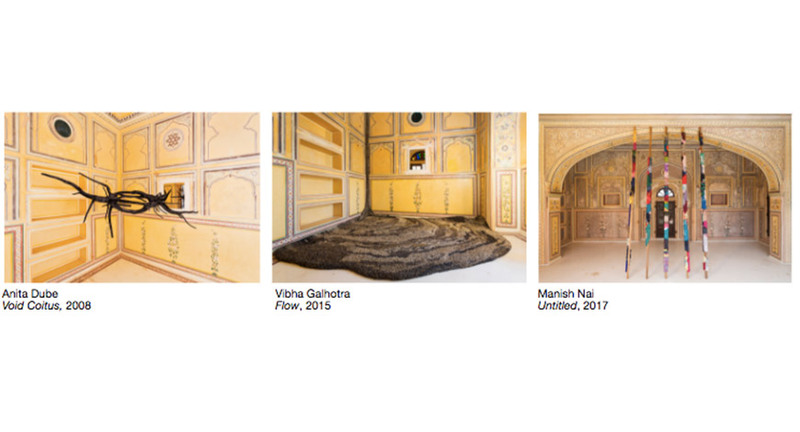 “The Sculpture Park at Madhavendra Palace, Nahargarh Fort, Jaipur will be the first of its kind where an Indian state has collaborated with a non-profit organisation to support contemporary art. We are thankful to the Government of Rajasthan for this alliance and are certain that it will set a great example on how imperative public-private partnerships are in the promotion of public art. I am honoured to be a part of this initiative and thankful to everyone who is involved.” - Shreyasi Goenka, Co-Director Saat Saath Arts & Content Editor DNA. This partnership is a first of its kind where the Government has collaborated with a range of corporate sponsors and private individuals to bring a contemporary edge to India’s heritage properties, with the purpose of boosting national and international cultural tourism and visitors to the site. Eminent individuals from leading corporations supporting the project include - Shreyasi Goenka, Content Editor DNA & Co-Director, Saat Saath Arts; Shreevar Kheruka CEO, Borosil Glass Works Ltd; Siddharth Jain, Owner and Director, INOX Group; Pirojsha Godrej, Executive Chairman, Godrej Properties Ltd.; Ajay Kalsi, APTARA; Vishal Mehta, Managing Director, Rosy Blue, Dr. Swati Piramal, Vice Chairperson, Piramal Enterprises Ltd., Sangita Jindal, Chairperson, JSW Foundation; Tarini Jindal, Director, JSW Foundation and Mayank Singhal, MD & CEO, PI Industries. Specialists on board include, AMITY as Education Partner, Conde Nast as Lifestyle Media Partner, Famous Studio as Technology Partner, Google Arts & Culture Lab as Technology Partner, Grant Thornton as Accounting and Compliance Partner, IFFCO Tokio as Insurance Partner, Khaitan & Co. as Legal Partner, Navsoft as Technology Partner, Percept as Event Partner and Star Worldwide as Logistics Partner. Many renowned international galleries have also come forward to support this initiative by lending the artworks including Hauser & Wirth, London, Salon 94, New York, Xavier Hufkens, Brussels, Sikkema Jenkins & Co., New York and Livingstone Gallery, The Hague. Under the leadership of the Chief Minister of Rajasthan, the Hon'ble Vasundhara Raje, Rajasthan is evolving new, innovative art spaces, engaging artists, curators, institutions and transforming the milieu of the city. Historically the heart of Rajasthan’s arts and culture, Jaipur has changed the paradigm and enhanced the city’s connection to culture, heritage and visual aesthetics showcasing traditional and contemporary visual culture, embracing international artists and creating new. Now increasingly regarded as a catalyst for cultural intermingling within India and across the world, Jaipur is on a global art map and seeks to establish itself as a centre for artistic engagement in India by drawing from the rich tradition and culture from all over the world. The state’s cultural tourism has had a great impact after adopting the contemporary culture and supporting a series of cultural events like the renowned Jaipur Literature Festival and an international photography festival Jaipur Photo. In collaboration with eminent professionals from diverse fields, the state also supports various contemporary visual arts, photography and music. The Sculpture Park at Madhavendra Palace, Nahargarh Fort, is a great example of a public-private initiative and will encourage the Government to support contemporary art in India.